The Association of Vietnamese Scientists and Experts (AVSE) and the Ecole normale supérieure de Cachan (ENS Cachan) join forces to organize the first AVSE annual doctoral workshop. This workshop will be organized on Thursday and Friday the 13th-14th of September 2012, at the ENS Cachan. This is the first-ever event in honor of all Vietnamese Ph.D. students from all disciplines, who currently pursue a doctoral program in France. 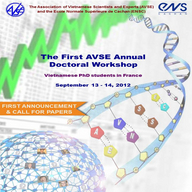 Open to all Vietnamese Ph.D. students as well as all interested students, the AVSE doctoral workshop aims to give the participants the opportunity to: meet each other, exchange research ideas and experiences, present their ongoing research projects and/or research papers, get comments from senior researchers and fellow students.